The cool looks of this plug can be seen in its first glance. An industrial look combination with the exuberance of the lotus flower. The cherry on the cake of obviously the stunning little Opal stone located in its centre. 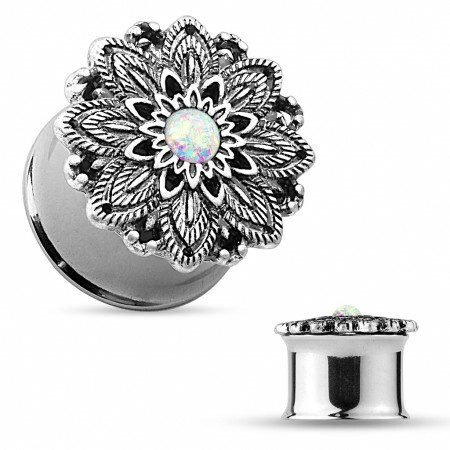 This plug has been made of 316L surgical steel but the flower carries a silver plating. The silver has been brushed to give it that older feel. It gives the flower a vintage look, a look where the Opal stone fits right in. As this plug is double flared it requires a certain flexibility from the earlobe the be placed. That is why you shouldn’t use this plug if your ear is still healing from it’s last stretch.